Ad from the Troy Daily Times, January 17, 1883. On January 17, 1883 the Troy Daily Times ran an ad for a lost watch that will quicken the heart of anyone fascinated by High Bridge, the covered wooden bridge that once soared above the Croton River. LOST—A small sized hunting cased, gold English watch. On the upper case is an engraving of High Bridge, Croton river, N.Y. The owner prizes the watch as a family relic, and not for its intrinsic value. The finder will be handsomely rewarded by calling on JOHN E. THOMPSON, Jeweler, &c., Mechanicville, N.Y.
Why was the watch a prized “family relic”? And why was the ad—which apparently ran in no other newspaper—published so far up the Hudson River in Troy, New York? Wooden Tubular Bridge Over Croton River, published by the London Stereoscopic Company. Courtesy of the New York Public Library. 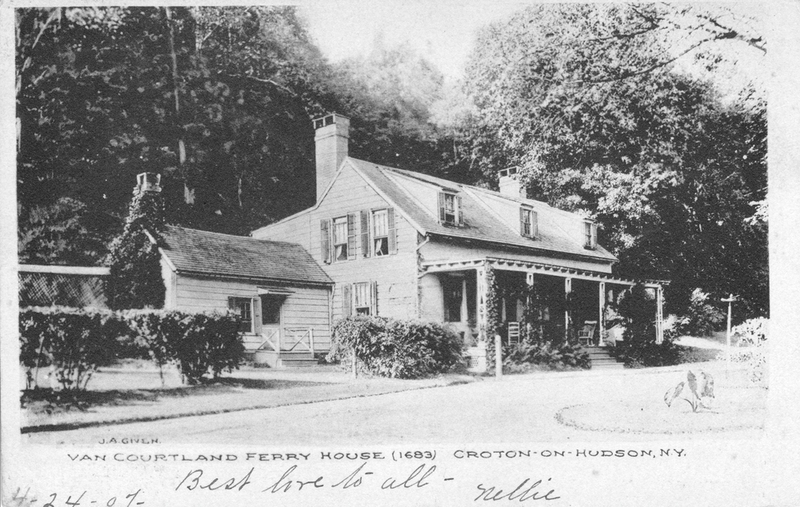 A postcard of the Van Cortlandt Manor Ferry House, circa 1907. Before we speculate that the watch may have belonged to Haywood we need to correct some of the errors in the article to learn more about the man responsible for our beloved bridge. “Mr. Joseph Haywood” was actually “Mr. Joseph Hayward” and he wasn’t really an architect, but more of a builder or construction supervisor. The “Lattice Bridge” he was proposing was not “after the manner of the Harlem Rail Road Bridge,” but based on his experience building a far more important bridge—the first railroad bridge across the Hudson River, which he had helped build in 1834–1835 at Troy. The location of High Bridge on a map published in 1868. Click the image to enlarge it. Unfortunately, despite Hayward’s association with such an important project, research to date has turned up little information about him. The fact that he was from Troy may answer the question of who originally owned the lost watch, but assuming it was his there are other mysteries. Why did he have a picture of High Bridge engraved on a watch? Was it significant because it was his first independent bridge construction contract—or was it particularly challenging to construct? Was the watch a gift from the grateful citizens of the three towns which paid for its construction? Does the fact that the ad says the watch was a family relic mean that Hayward had given it to a loved one? There’s one last question. Did anyone ever find the lost High Bridge watch? Next Post Harmon Hats—Everybody Needs ’Em!